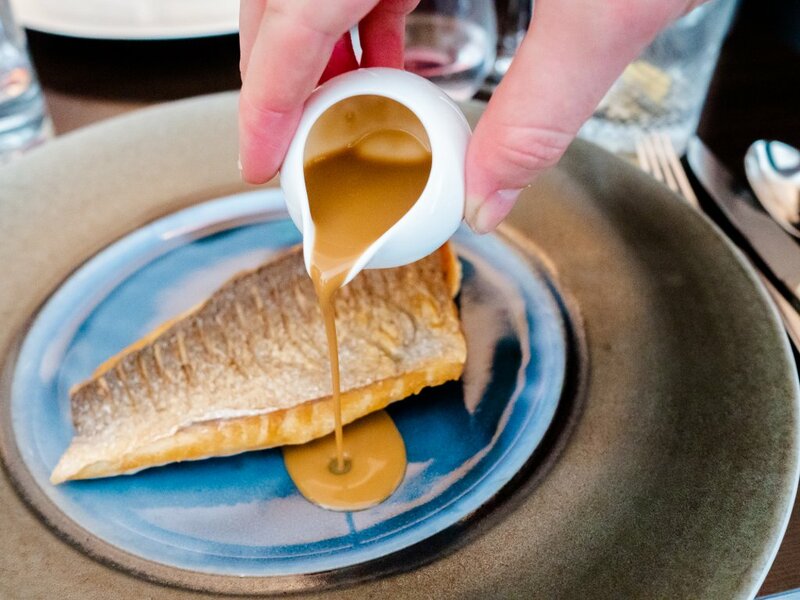 Paul Ainsworth’s 1 Michelin star town-house restaurant sits in the heart of Padstow. Earmarked for a special occasion, Alex and I have been talking about visiting for a while now, as we’ve heard fantastic things about the food and wanted to add a 1 Michelin star to our experience list (last year during our ski trip, we visited a 2 Michelin star restaurant for Alex’s dad’s birthday which was an experience we’ll definitely never forget!). 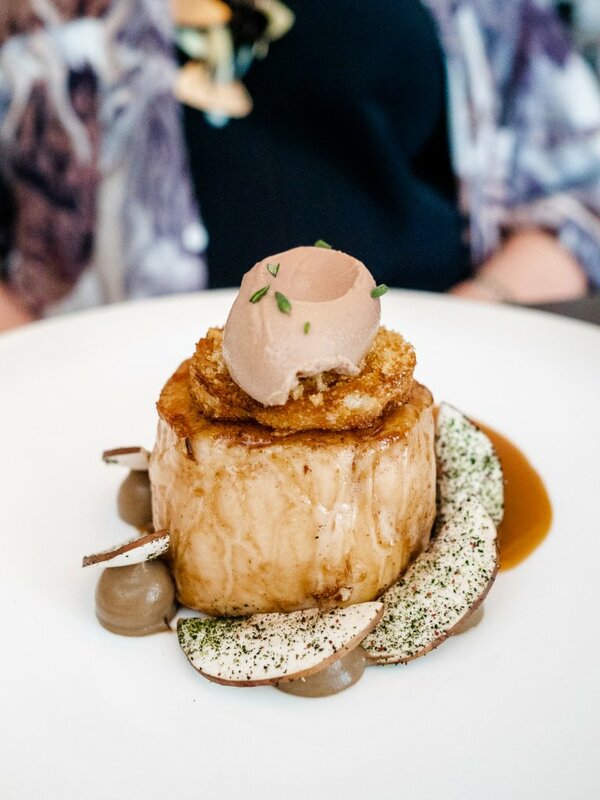 One of only 4 Michelin star restaurants in Cornwall (the other three being Nathan Outlaw’s restaurant in Port Isaac, Outlaw’s Fish Kitchen in Port Isaac, and the Driftwood Hotel in Portscatho), Paul Ainsworth’s is located in a beautifully restored Georgian townhouse in the popular harbour town of Padstow. I’ve only ever been to Padstow once before for the fantastic Christmas Festival with Sharp’s Brewery. When we visited then, the streets were buzzing with festive markets, music from boat parties, and exciting chef demos dotted around. On this day, Padstow seemed almost just as busy! It’s a hotspot for tourists with plenty of well known Cornish boutiques and restaurants, even during Spring. 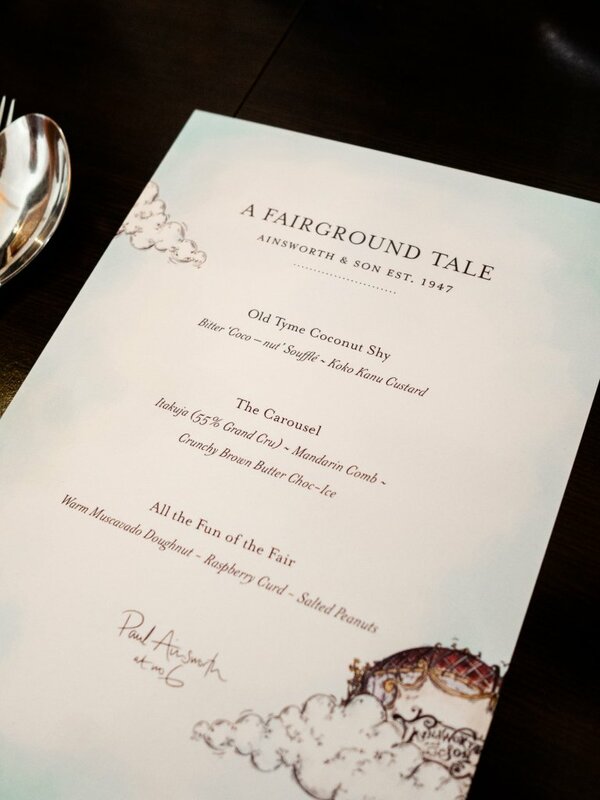 Last month, Alex turned 25, and as a celebration his parents took us for lunch at Paul Ainsworth’s to finally experience what it’s like! Walking in, the entrance is unsuspecting (you could easily walk past the door thinking it was someone’s home!) but the decor inside is an eclectic mix of retro/vintage finds and modern luxury. We were seated and shown the menus, and ordered some wine while we enjoyed our complimentary homemade breads and whipped butters. 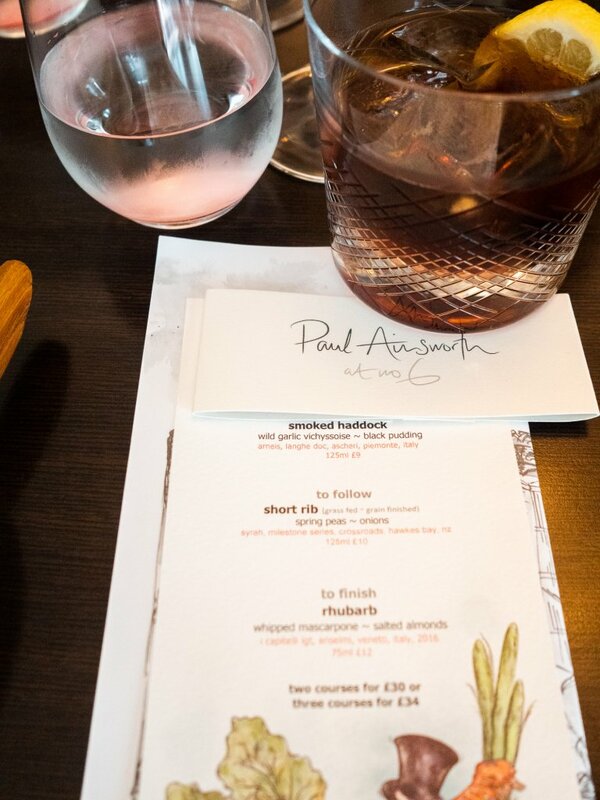 Paul Ainsworth offers a set menu of two courses for £30 or three courses for £34, or alternatively you can choose from the a la carte; I love how all the menus are presented on thick card, with custom watercolour illustrations and held together neatly with a branded band – just little touches that felt really luxurious! Alex’s parents must have mentioned his birthday when they booked, as there was also a handwritten envelope with a card inside for Alex, wishing him a happy birthday from all the team. Again, a really thoughtful idea! 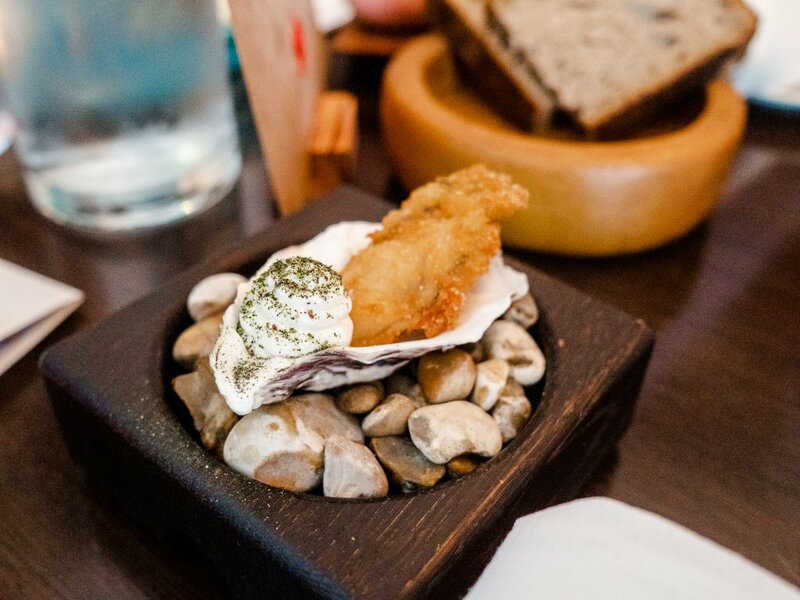 Our amuse bouche was a battered oyster with aioli, presented in its shell on a cute little pebble platter. It looked great, although I was slightly apprehensive! My only other experience with oysters was being given a slimy one age 7 in France and spitting it out across the table… however this one was delicious! Obviously most things when fried with some tasty batter go down a lot better, but it’s definitely made me rethink oysters… Falmouth Oyster Festival here I come! 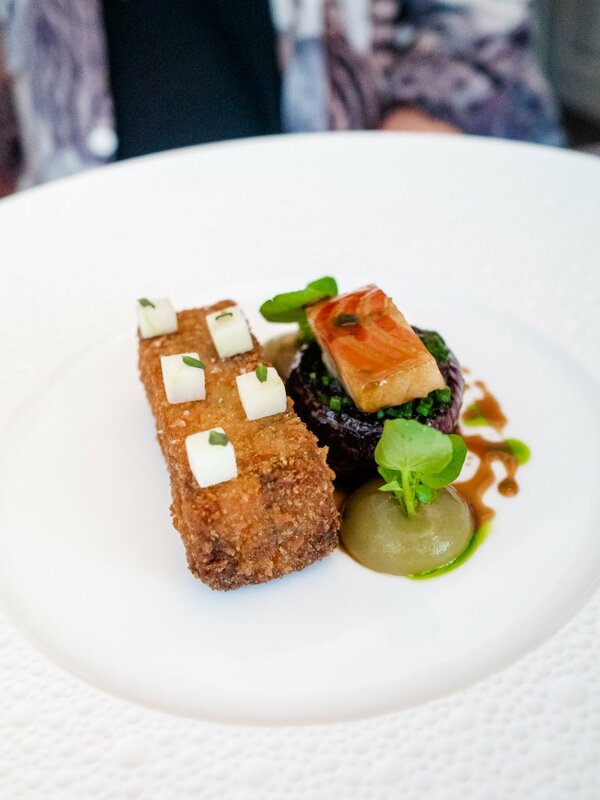 For starters, I chose the smoked haddock ‘quiche’, which came with a foam sauce and caviar, while the others had the pig’s head fritter with smoked eel. An interesting combo but apparently it tasted good! Meanwhile for main courses, a couple of us had the catch of the day which came with a delicious crab sauce and asian style salad, whilst another had the chicken ragout, and Alex had the soy glazed duck with ‘pyo’ salad. This arrived immaculately presented and even came with its own pot of peking tea as sauce! The food was all beautifully presented (although in the image above you can’t see the green veg that came with my fish – but trust me it was there!) and all the flavours were amazing! 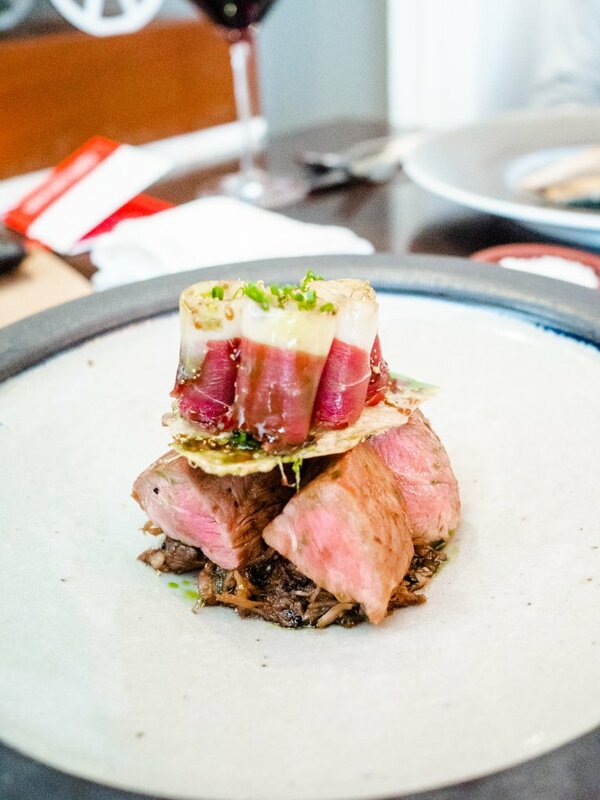 The only thing we said was that each of the individual flavours from within the dishes were so tasty and strong that that they ended up almost overpowering each other, so that if you combined all the elements on your plate, they were competing rather than working together. First up was a our ‘coconut shy’; a delicious coconut custard tart paired with the most decadent chocolate and coconut souffle you’ve ever seen! 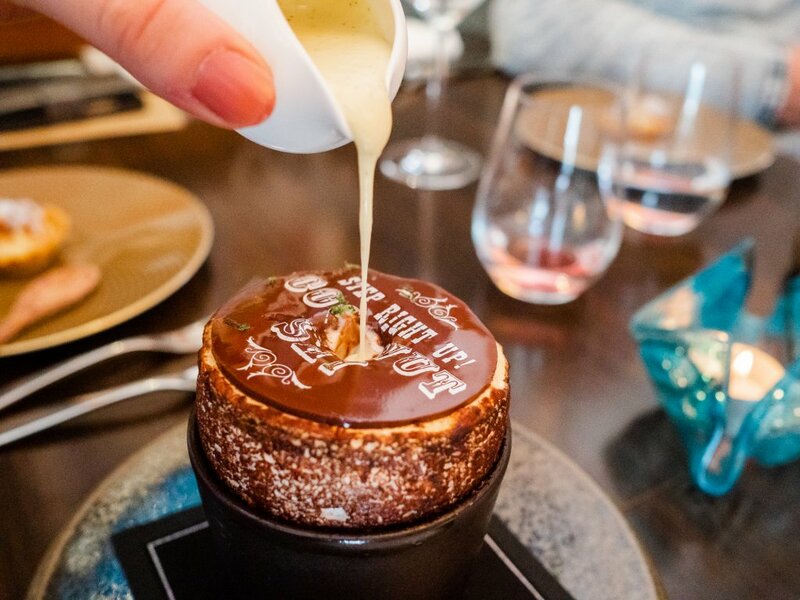 The servers came and poured warm custard to melt the souffle, which was decorated on the top with vintage-fair style fonts in a chocolate sauce. 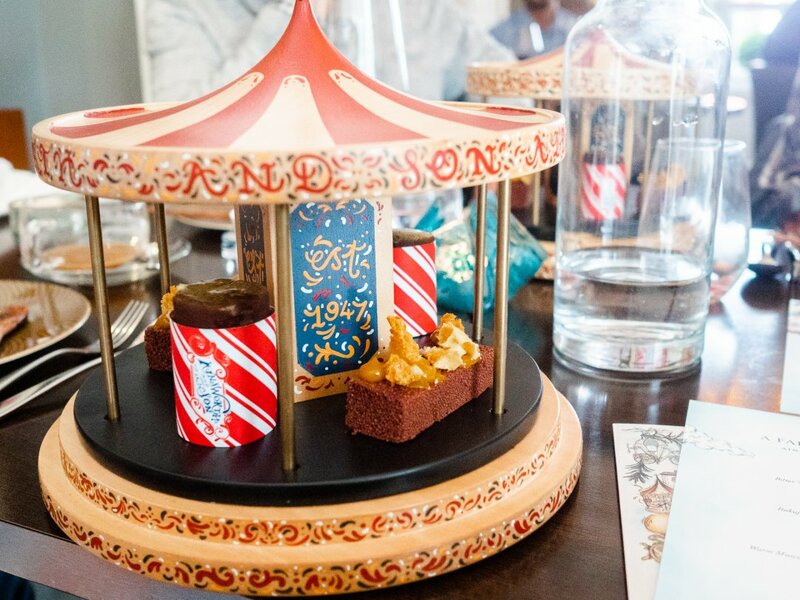 The next course blew us away – a chocolate honeycomb and peanut butter choc-ice each served on a custom built wooden carousel brought over to our table! 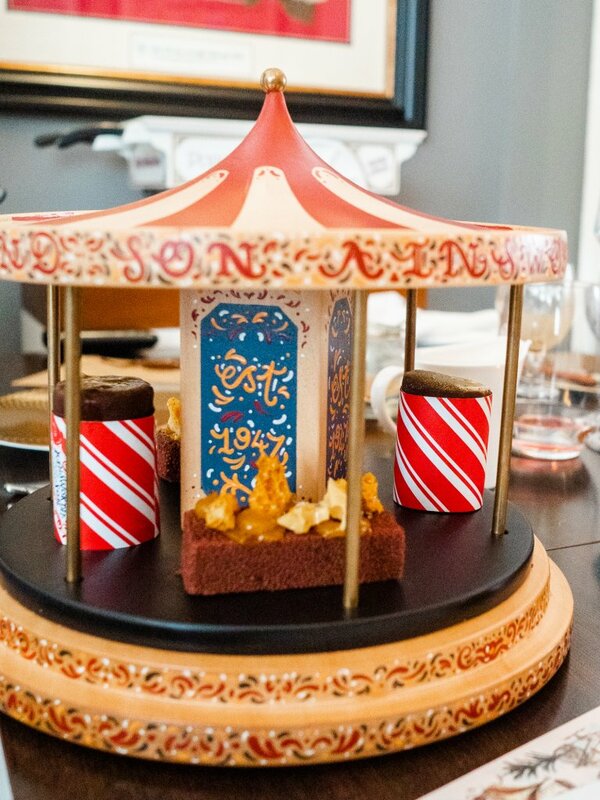 Was a unique and amazing way to serve a dessert. I loved addition of peanut butter to a classic choc-ice too! As you can imagine, we came away from the restaurant absolutely bursting full, but definitely feeling as though we’d had an experience. 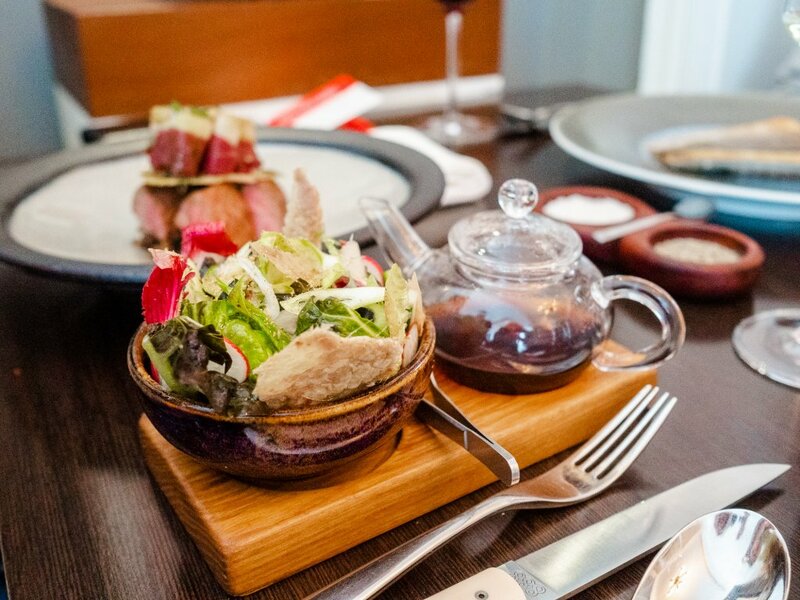 I really enjoyed every course of the meal, and would recommend it for a special occasion. However I would say that the service during our lunch wasn’t great at all; considering it is in fact quite a small restaurant (although it was busy, for a Friday lunch in March! ), the service was very slow and there were several points at which other people were served well before us when they had finished or come in after us. I also felt the servers just weren’t trained that well. 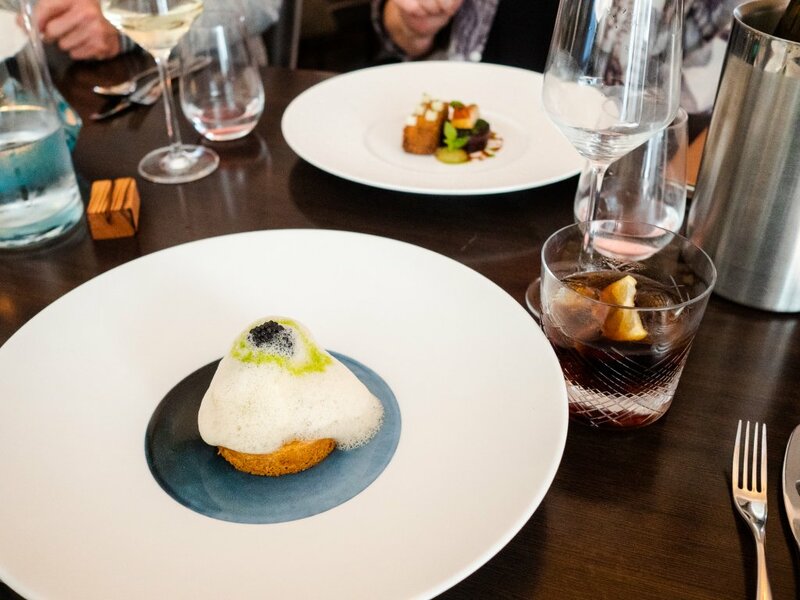 In a Michelin star restaurant you expect really special service that makes you feel like you’re getting value for the money you’re paying, however in this case it was really disappointing how slow and unconfident the staff were. Our main waitress mumbled at us and just didn’t have the confidence you’d expect in a restaurant like that, which was a shame. 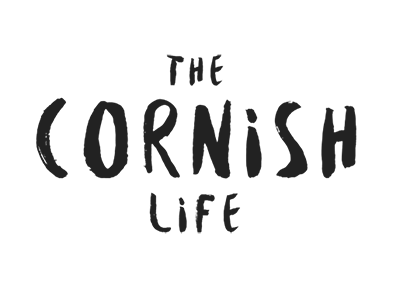 We’ve been to a couple of more casual places to eat since this meal where the service has been fantastic, and it really makes it stand out a lot more as being quite poor. Anyway, this could have been due to it being the start of the season with new staff, and of course your experience will totally depend on which staff you have, but I thought it should be said as when you’re in a restaurant that expensive you really expect a bit more. Thanks for reading! 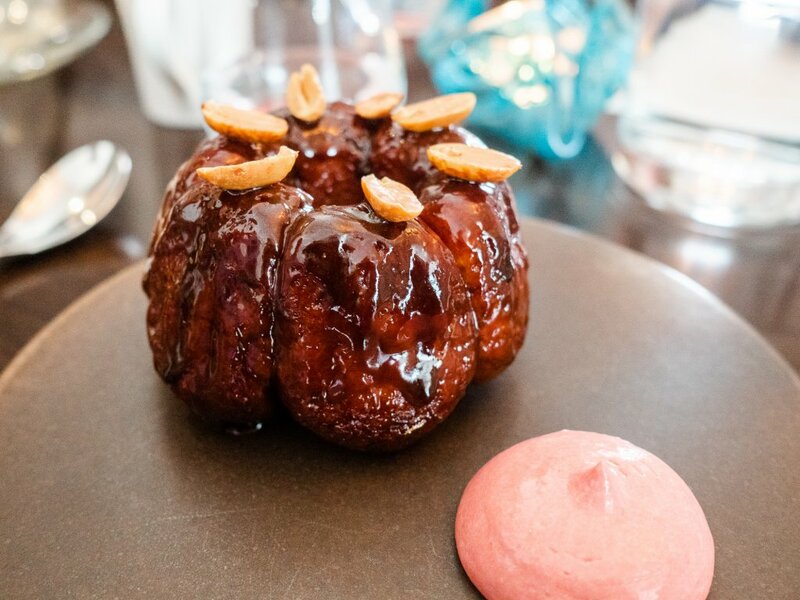 Have you ever been to a Michelin star restaurant? I’d love to hear recommendations below!